How can we transform school grounds into rich, outdoor environments for all children? There are many things schools can do on any school ground to improve and enrich students’ daily experiences outdoors and to teach them to be stewards of their local environment. This coming Saturday, Sept. 24, is the fifth annual celebration of Green Apple Day of Service. On this special day, school across the country—and around the world—will gather their communities to improve their school sites and children’s well-being by creating healthier, safer and more productive learning environments. This year, we encourage school communities to put their energy toward improving their school grounds by holding a schoolyard workday in collaboration with parents, teachers and students. A movement to make school grounds greener and connect students to nature is gaining momentum, interweaving the ideas of urban sustainability and ecological design with education, health and community engagement. Green schoolyards bring nature back to cities and suburbs by transforming barren asphalt and ordinary grass into vibrant environments for learning and play, set within rich, local ecosystems that nurture wildlife and the natural processes that underlie and sustain our urban areas. Green schoolyards foster students’ social, physical and intellectual growth by providing settings for collaboration, exploration and wonder. Two nonprofit organizations, Green Schoolyards America and the International School Grounds Alliance, partnered this year to create a set of free online resources to help schools get started in enhancing their grounds for outdoor learning, play and ecology. The three publications in this set include a total of 147 outdoor activities for youth ages 3–18, written by 123 collaborating organizations in the United States and 16 other countries. The guides were written by authors from different geographic regions, but all of the activities are intended for use by all schools. Please see the links below for free digital copies of this school ground Activity Guide set and a combined Table of Contents that connects all three publications. We hope these ideas inspire you to engage in outdoor activities at your own school, wherever you live. 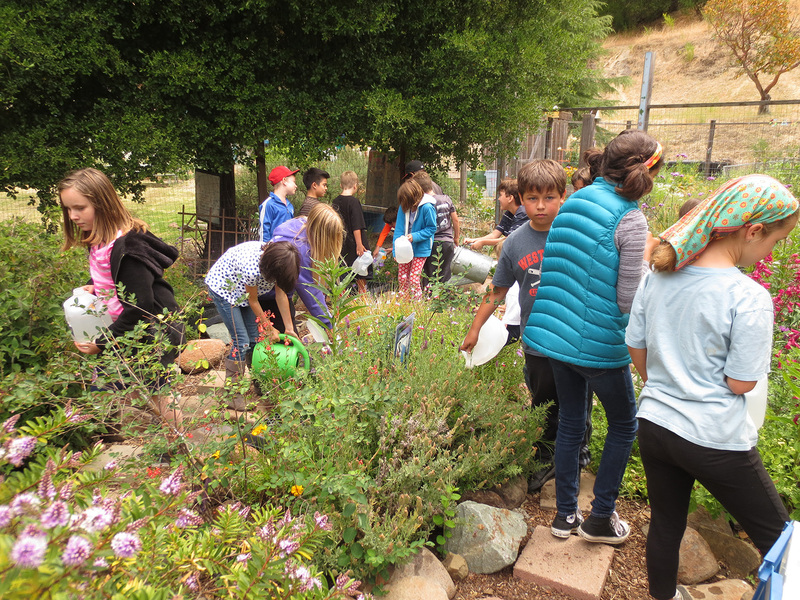 Manor Elementary School in Fairfax, California, has been teaching children to take care of their local environment for many years and has applied some ideas from the Activity Guides. Teacher Laura Dax Honda often leads school ground stewardship efforts with collaboration from her colleagues. The school has a Green Team that contributes to the school’s composting and recycling efforts, helps clean up trash on the grounds and conducts energy audits of their school building. In addition, they set up a 3,000-gallon cistern to capture rainwater for use in their pollinator garden, reducing their need for municipal water in the dry California climate. The school’s beautiful pollinator garden is also an outdoor science laboratory used for wildlife observation, including the study of birds, bees and butterflies. These projects not only teach the idea of stewardship to the students at Manor Elementary, they help the school reduce its impact on the local environment. Children from Manor School water the school garden. Photo credit: Laura Dax Honda. Feature image: Students reuse one-gallon jugs, brought from home, as watering cans to distribute water captured from the schoolyard cistern. Photo credit: Laura Dax Honda.